Answering questions is not my forte. Question me and you will get a response that is almost never what is expected, particularly if you’re wanting me to ease your doubts. I’ve observed and pondered this quirk in my behaviour for a long time now and these days I can’t quite recall whether I’ve always been this way or it just kind of crept up on me one day – while I was dreaming. I love to learn – new things, old things, patterns and disruptions, flows and cycles. Life is so endlessly intriguing and engaging through my eyes that it seems impossible for me to imagine any other way of being. So I answer questions with an almost unconscious intent of setting up the conditions for a learning experience, preferably involving laughter, smiles or little nods of recognition that we humans are all, essentially, in the same boat. It is my heartfelt wish, from the centre of all that I am, to share the joy of learning and living with you. I want us to take a step or two down the road together, however brief. I want you to offer me some way to relate, to walk away with some idea of how your shoes feel and your most recent speculations on the imprecise nature of our current destination, whatever it is that you’ve got going on. I want you to take your choice from the menu of delights, insights, delusions and intuitions that may come tumbling from my being in any one moment and use them. Use them to bring yourself home if you’ve lost your centre, use them to inspire you into your next learning or maybe add a little light to your next great or tiny goal. I most assuredly see myself in the business of elevation and reciprocity. Sooner or later it also seems to turn out that when you use what I have on offer to constrain or reduce the reality of me, invariably you will find that you’re presenting me with an even greater gift – the irrefutable proof that there are times when people have completely given up on themselves and others. The broken times, when someone has entered the world of self-justifying or self-gratifying illusions. We are not separate, I know your pretend vacuum-sealed self is imaginary and hurts you one thousand times more than it hurts me. This is not news. I know because I’ve spent lots of time trying it out. I most certainly cannot conscionably recommend hanging out on that particular limb for too long, it’s bloody exhausting [or bloody and exhausting, your pick]. You don’t have to like me to enjoy the journey. I don’t have to like you for us to exchange genuine service with each other. Vile, virtuous, vexatious or the epitome of verity – I regard your presence as my reward. So go ahead and present yourself as a poo-flavoured dog-biscuit and watch me laugh at all the time and energy that was just wasted. Seriously, come, lay your doubts on me brothers and sisters, then strap yourselves in and grab hold of your socially-engineered default-configuration hats, I think we’re in for a one hell of a wild ride! and for those who have and can’t get enough. all the world would be very concerning. framework of time. I’ll pass on that one. like that too. Isn’t this my right? wondering how I can fill that gap for you too. life today that I am not enjoying. indignation to prolong a bout of pain. thirst won’t make me drink. return? I can’t say where or to what. that I don’t know a single thing. life might never be untangled. the very bedrock of familiar beliefs. Who needs that kind of inconvenience? beyond any and all reason? so please don’t walk on the grass. We can’t resolve things peacefully? Or hell they’d go more easily! Got a quick story for you. I shared this with a great friend who laughed a lot, but the thing is… most of the people I communicate with seem quite peeved by this story. So now I have to share, because that seems an odd response to something I find delightfully funny. Feel free to share your joy or disgust in the comments…surely there’s something for me to learn here…perhaps? I’ve actually been quite ill – some kind of infection. Nearly over it now. On Friday I read up on how the antibiotics are supposed to work and decided that I needed to be still for an hour after taking each one so my body has the resources available for a full scale attack. Being still, yeah right! I started thinking about pi. Someone mentioned it on TV the night before. Jewish guy we rescued from destitution years ago used his ability to recite pi to 14 places as part of his argument for why jews are genetically superior. 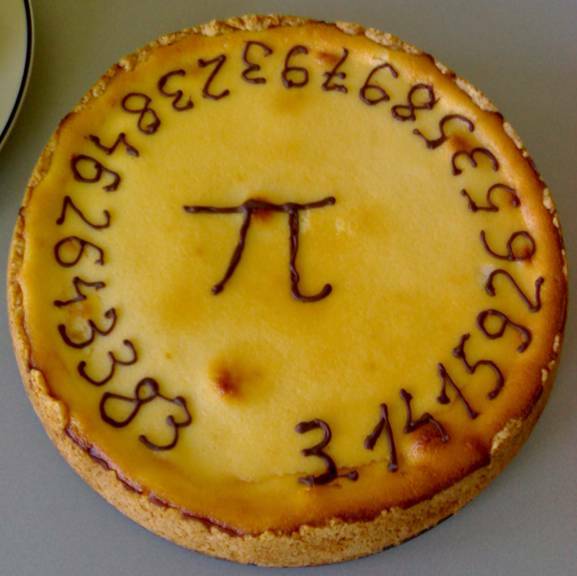 My friend Greg can rattle off pi to 12 decimal places. I recalled that 22/7 was a representation of pi – something I was told in school, but I ran the numbers in my head and quickly discovered it’s completely wrong. So I looked up the decimal representation. Ten minutes later I have memorised pi to 27 decimal places. I thought that was enough considering I was supposed to be relaxing. What can I say other than it’s an intriguing number/concept? An hour later in the shower I was reciting pi however, after the 27th number I found myself saying – “and the last three numbers are 279.” As in, to round up to 30 places. Cracked myself up. Thus far I have no use for this info. I will laugh even more if I do find a use for it.